The power amplifier receives its power supply via the MAINS IN connector. Only the provided power cord may be used. During installation, always separate the power amplifier from the mains. Connect the power amplifier only to a mains network, which corresponds to the requirements indicated on the type plate. The power drawn from the mains network is converted into output power to feed the connected loudspeaker systems and into heat. The difference between power consumption and dispensed power is called power dissipation (Pd). The amount of heat resulting from power dissipation might remain inside of a rack-shelf and needs to be diverted using appropriate measures. The Mains Switch on the front panel separates the power amp from the mains. Turning the Mains Switch to ON starts booting up the power amp. A soft start circuit compensates mains inrush current peaks and thus prevents triggering AC mains fuse when switching on the amplifier. Speaker system switch-on is delayed by approximately 2 seconds via output relays, effectively suppressing any possible power-on noise, which otherwise might be heard through the loudspeakers. 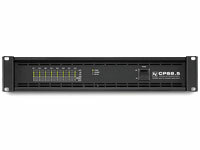 CPS amplifiers have been designed for installation in a conventional 19-inch rack case. Attach the power amp with its frontal rack mount ears using 4 screws and washers as shown in following illustration. Additionally securing the amplifier at the rear becomes necessary, if the rack case in which the power amplifier has been installed will be transported. Failure to do so may result in damage to the power amplifier as well as to the rack case. Attach the power amp as shown in the illustration using 4 case nuts and screws. Brackets for securing the power amplifier are available as accessories. As with all Electro-Voice power amps with fan cooling, the airflow direction is front-to-rear, obviously because there is more cold air outside of the rack case than inside. The power amplifier remains cooler and dissipating the developing waste heat in a specific direction gets easier. In general, setting up or mounting the power amplifier has to be done in a way that fresh air can enter unhindered at the front and exhausted air can exit at the rear. When installing the power amp in a case or rack system, attention should be paid to these details to provide sufficient ventilation. Allow for an air duct of at least 60 mm x 330 mm between the rear panel of the power amplifier and the inner wall of the cabinet/rack case. Make sure that the duct reaches up to the cabinet’s or the rack case’s top ventilation louvers. Leave room of at least 100 mm above the cabinet/rack case for ventilation. Since temperatures inside of the cabinet/rack case can easily rise up to 40°C during operation of the power amp, it is mandatory to bear in mind the maximum allowable ambient temperature for all other appliances installed in the same cabinet/rack case. Blocking/closing the power amp’s ventilation louvers is not permissible. Without sufficient cooling/ventilation, the power amplifier may automatically enter protect mode. Keep ventilation louvers free from dust to ensure unhindered airflow. Do not use the power amplifier near heat sources, like heater blowers, stoves or any other heat radiating devices. To ensure trouble-free operation, make certain that the maximum allowable ambient temperature of +40°C is not exceeded. For fixed amplifier installations in a device control room that incorporate a central air-cooling system or air conditioners, calculating the maximum heat emission may be necessary. The power amplifier has two fans. The fans are temperature controlled, i.e. they are not running permanently but the running speed of the fans is controlled continuously depending on the ambient temperature. That in return ensures very silent running during idle state. The temperatures of the power amp’s channels are registered and monitored separately. The MODE switch on the power amp’s rear panel defines how the audio inputs handle the input signals. The amplifier types CPS4.5 and CPS4.10 allow the configuration of audio inputs CH 1/CH 2 or CH 3/CH 4, the amplifier type CPS8.5 additionally allows configuration of audio CH 5/CH 6 or CH 7/CH 8. In the following description of the modes DUAL, PARALLEL or BRIDGED the generic letters A and B are used for the two audio inputs of a MODE switch (e.g. for switch CH 1/CH 2 input A corresponds to CH 1 and input B corresponds to CH 2). In DUAL mode, the two channels of the power amplifier work independent from each other. This mode of operation is being used for all 2-channel applications, like stereo or Bi-Amp (active) operation. Using the input level controls on the power amp’s rear panel allows independently adjusting the channels’ amplification. In PARALLEL mode, the inputs of channel A and channel B are directly electrically linked. The audio signal has to be applied to the input connectors of channel A. Using the input level controls to independently control the amplification of the two channels is still possible because only the channels’ inputs are linked. PARALLEL operation is the mode of choice, whenever the same input signal drives multiple power amp channels of a large system installation, e.g. when driving massive bass arrays. In PARALLEL mode, the input signal has to be fed to input channel A only. In BRIDGED mode both amp channels work in push-pull operation to provide doubled output voltage. The audio signal has to be applied to the input connectors of channel A, amplification is set via input level control of channel A only. BRIDGED operation is the mode of choice, whenever high power speakers are used. In BRIDGED mode operation, it is not allowable for the load connected to fall below a value of 4 ohms. Extremely high voltages can be present at the output. The connected speaker systems must be able to handle such voltages. Make sure to completely read and fully observe power rating specifications of the speaker systems to be used and to check them against the output power capacity of the power amp. Different output modes are available for the amplifier’s output channels. Each channel can be switched to high impedance mode (HZ) for driving 70 V or 100 V loudspeakers without output transformers (Direct Drive). In DUAL or PARALLEL mode each output channel’s OUTPUT setting can be independently set. In BRIDGED mode for each pair of outputs only the output setting of the channel with odd number (1, 3, 5 or 7) matters, the OUTPUT setting of the channel with even number (2, 4, 6 or 8) is ignored. Following section describes the four different OUTPUT settings of CPS amplifiers. In 2 Ohm mode the power amplifier reaches maximum output power having a load of 2Ω connected. Up to 4 cabinets having a nominal impedance of 8Ω each can be driven by each amplifier channel. This mode should be used if a high number of speaker with medium or low power rating should be driven in low impedance mode (LZ). The VLD mode (Remote Control Module required) allows adjusting the output power of the amplifier channel. In 4 Ohm mode the power amplifier reaches maximum output power having a load of 4Ω connected. Up to 2 cabinets having an impedance of 8Ω each can be driven by each amplifier channel. This mode should be used if speakers with high power rating (e.g. Subwoofers) should be driven in low impedance mode (LZ). The 70 V mode allows connection of 70 V loudspeakers lines (Direct Drive) in high impedance mode (HZ) without using output transformers. In this case the maximum number of loudspeakers connected to an output channel is only limited by the amplifier’s output power (500 W for CPS4.5/8.5 or 1000 W for CPS4.10). This mode should be used if the distance between amplifier and speaker is larger than 50 meters (approx. 150 feet) and/or a high number of small speakers (e.g. ceiling speakers) is used. The 100 V mode allows connection of 100 V loudspeaker lines (Direct Drive) in high impedance mode (HZ) without using output transformers. In this case the maximum number of loudspeakers connected to an output channel is only limited by the amplifier’s output power (500 W for CPS4.5/8.5 or 1000 W for CPS4.10). This mode should be used if the distance between amplifier and speaker is larger than 50 meters (approx. 150 feet) and/or a high number of small speakers (e.g. ceiling speakers) is used. Selecting an output mode, as described in section 7, provides an extremely practical way of matching amplifiers and connected loudspeaker systems. The first table below shows all possible combinations of output power and connected load for power amps operated in low-impedance mode. Retrofitting an optionally available Remote Control Module (e.g. RCM-810) allows freely programming individual amplifier channels via Variable Load Drive (VLD). For power amplifier models CPS4.5 and CPS8.5 it is possible to freely select the output power in a range between 100 watts to 500 watts for loads ranging from 2 ohms to 10 ohms per channel. For the power amplifier model CPS4.10 it is possible to freely select the output power in a range between 100 watts to 1000 watts for loads ranging from 2 ohms to 10 ohms per channel. Additionally, the Remote Control Module RCM-810 allows switching a 50 Hz High-Pass filter on per channel. This may be advantageous when driving small or medium sized full-range cabinets to eliminate unwanted sub-frequency content in the audio signal. Set the DIP-switch MODE to 2Ω/VLD for power amplifier channels to be operated in VLD mode. Use the DIP-switch OUTPUT to select DUAL or PARALLEL output mode for power amplifier channels to be operated in VLD mode. VLD is not available in the BRIDGED output mode. Use IRIS-Net to configure output power, impedance and High-Pass filters of individual channels. Detailed information on the configuration, control and monitoring of amplifiers with Remote Control Modules installed can be found in the documentation that comes with the IRIS-Net software application. The configuration of power amplifier channels is stored nonvolatile in the Remote Control Module. Please keep in mind that the VLD configuration in IRIS-Net only affects channels set to 2Ω/VLD mode. Operation modes 4 ohms, 70 V and 100 V are not affected by VLD. Power amplifier channels behave as described in section 7. The use of VLD considerably expands the adaptability of a power amplifier. The second table below lists some spplication examples of VLD. The ON DELAY switch on the amplifier rear panel allows selection of the power on delay time. The following table shows possible switch settings and corresponding delay times in seconds. The setting of ON DELAY is ignored if a Remote Control Module is assembled. Inputs are electronically balanced. Whenever possible, using balanced audio signal feeds at the input of the power amplifier is always preferred. Unbalanced connections should only be used if the cables are very short and no interfering signals are to be expected in the vicinity of the power amplifier. In this case, bridging the screen (shielding) and the pin of the inverting input inside of the connector is mandatory. Otherwise, a 6 dB drop in level could result. Please also see following illustration. Due to their immunity against external interference sources, such as dimmers, mains connections, HF-control lines, etc., using balanced cabling and connections is always preferable. See illustration right for connecting speakers in DUAL or PARALLEL mode. Only connection of CH1 and CH2 is shown, the other channels have to be connected identically. The correct connection is also indicated at the amplifiers rear panel. See illustration right for connecting speakers in BRIDGED mode. Only connection at CH 1/CH 2 is shown, the other channels have to be connected identically. The correct connection is also indicated at the amplifiers rear panel. In BRIDGED mode operation, it is now allowable for the load connected to fall below the values given in the BRIDGED mode table. Extremely high voltages can be present at the output. The connected speaker systems must be able to handle such voltages. Make sure to completely read and fully observe power rating specifications of the speaker systems to be used and to check them against the output power capacity of the power amp.